If you wish to prove that your new business is just a run-of-the-mill and unoriginal, vanilla-flavoured company like the rest, just keep on banging out those quickly-written and, to be honest, shallow blog posts. Every so-called social media guru screams, ‘Content is King’. No! Content is not King; Engagement is King. If you put out even more mediocre, average and truly uninsightful blog posts then you will simply be adding to the mass of mediocrity that clutters our inboxes. Owner-managers (the smaller, younger naive businesses) find it almost impossible to sort the good from the bad in the sea of offers of help. Their very naivety excludes them from knowing what they don’t know and what it actually is that they need. As a result, they tend to jump from one exciting initiative to the next. On the other hand, owner-directors (in larger and more mature businesses) are not taken in by the breathless excitement of those selling hope to the needy. However, they find it hard to find the right assistance (being too big for the owner-manager offerings and too small for the offerings of the big consultancy houses). As a starting point I would suggest that asking, ‘Where should the owner-director look for help and support?’ may actually be the wrong question. The right question might be to ask ‘Exactly what is the problem and what are the underlying causes?’. Unfortunately most suppliers of assistance do not carry out the appropriate diagnostic. Marketing consultants assume the problem is marketing, social media consultants assume the problem (and the solution) is social media and so on. I would argue that what the business actually needs is an objective diagnostic, a look under the bonnet that examines what the key issues are and some sort of prioritised shopping list. The systematic approach is especially required for the owner-director. Too often, the focus of interventions is on the business and the business goals and performance indicators. While it may be easier to measure and report on the easily measurable (the things that we can enter on to a spreadsheet), this rarely tells the whole story. The items that are tougher to measure are often left out of the equation. This is ironic as these are often the really important things. The sort of questions I am referring to are less tangible but more about many owner-directors’ definition of success: Is this business fulfilling its purpose? Have we created a team and culture that is positive and self-reinforcing? Is this business sustainable in the long-run? Does it allow me to do what I really want to do with the rest of my life? Is it going to provide me with the funds I need (now and later)? As we come out of the recession and as a little bit of pressure is coming off businesses so more and more owner-directors, managing directors and CEOs are starting to question the very fabric of their business and why they as individuals do what they do. There seem to be more and more people searching for answers, if only to validate that what they currently do is ticking all the right boxes. Businesses are looking to create far more of a well-rounded solution recognising the need to create balance as well as a sustainable future. This requires an understanding of the bigger picture as well as its component parts: aspiring to develop a flourishing team, sales processes, cash-flow and profitability that deliver on the greater goals of the business. It seems that it is no longer just about the profit and the ROI but now there is a desire to create a more complete business that it is more satisfying and rewarding to own and run. The owner-director is very different from the smaller, owner-manager. They have too much to lose (the nice car, home and holidays that come with painstakingly nurturing and growing a business) and they are no fools. What they are looking for is far-more considered support from people who have a mix of: been-there-done-it expertise, grey-haired wisdom, background credibility and the ability to communicate and assist. At this point in the business, one is looking for support in the long game, recognising the benefit of consistent and constant improvements (3% here and 4% there) that will create an engine for growth. Jim currently works 5 days a week. In effect, he contributes 20% of a week's value on each working day. He admits that if he only worked four days a week (ie took Fridays off), then he could easily do “25% days”. In other words, with a Friday off he could and would work more productively on the other four work days. FACT: You never come up with great light-bulb moments when sat in front of the computer. 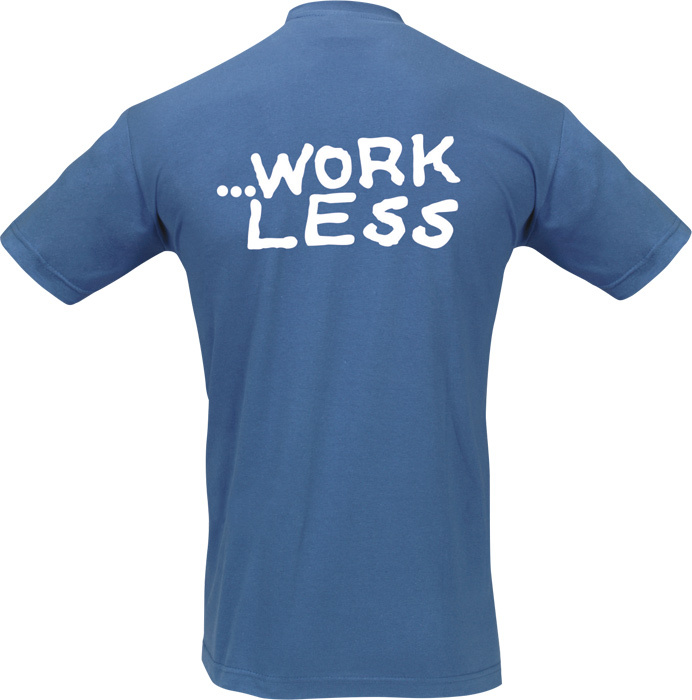 Working harder creates burn-out. Working harder satisfies the voice in your head, the monkey on the shoulder, who says, “If you are not working long hours then you are short-changing yourself". What utter tosh.